From Albertville follow the N90 motorway towards Moutiers. Take the Exit 40 Les Menuires / Val Thorens. D117. After St Martin de Belleville, Saint Marcel and Les Granges, take the right turn off the Praranger / Le Bettex. Le Bettex is at the end of the road. We are by the central village square next to the playground. 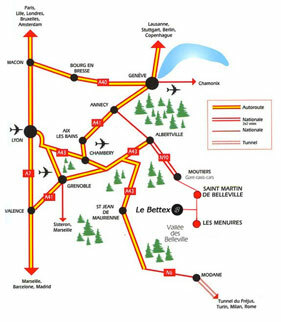 The SNCF train station of Moûtiers – Salins / Brides Les Bains is located 25 km from Le Bettex. From there you can get to Les Menuires by taxi, coach or rental car.